KSLQ has been around since 1972. Originally at 98.1 and now at 104.5. 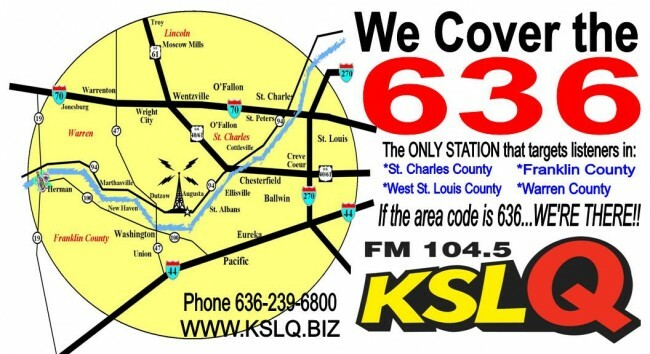 KSLQ serves St. Charles County, Franklin County, Warren County, western St. Louis County and northwestern Jefferson County. KSLQ’s format is Hot AC. It’s today’s music from Grammy award winning artists like Kelly Clarkson, Carrie Underwood, Bruno Mars, Matchbox 20 and more. Mix in the hits from 80’s, 90’s and 00’s and you have Today’s Best Music. There are over 779,000 people in our coverage area. We’re proud to serve this rapidly growing area. Our coverages area includes 43 Zip codes in 5 different counties. Our programming is targeted at adults 18 to 54 with our core demographic being women 25-49. Approximately 70% of our audience is women and we love it. Women are the movers and shakers in our society and especially in our economy. 80% of all retail purchases are made expressly by women or highly influenced by women. KSLQ Reaches this important demographic like no other station in the area.